Concrete slabs are somewhat infamous for not being entirely level, even with the best care during the initial pour. Some flooring types/applications do not have the flexibility to withstand these uneven areas of a subfloor. The standard solution is to apply a leveling compound, which can effectively level the slab surface to tolerances that are within specification. However, that leveling compound also has some requirements for successful installation and operation. One of the challenges of using leveling compound is not just getting it level. It’s also working fast enough to get it in place. From the moment you start to mix until the compound sets up, you’ll typically have about 20-30 minutes to get it in place and smoothed out before it starts to set and loses its “self-leveling” characteristics. Acrylic-based compounds will extend that time slightly, but will also require a longer drying time before the next step of the project can proceed. 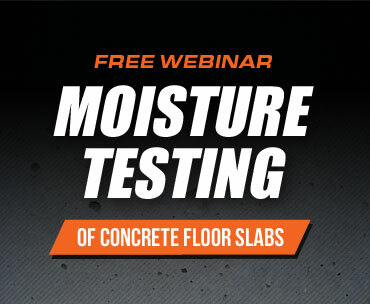 What does that have to do with concrete moisture? It means that you need to be positive that the concrete slab is properly prepped and ready for the compound to go down on ideal conditions: removing all dust and dirt from the floor by vacuuming, using the appropriate cleaner for stains or spills, having all tools at the ready, and then damp mopping the slab lightly, letting it dry completely before applying the compound. Obviously, different manufacturers may have different installation/preparation requirements for their products, so consult the manufacturer directly for specific guidance. It also means testing to be sure the slab does not have elevated relative humidity (RH) levels prior to doing any leveling. More times than not, if there are elevated moisture levels present in the slab, said excess moisture levels will need to be addressed prior to proceeding with the leveling portion of the project. Side note: Although not directly related to the moisture in the slab, the amount of water that you add to the leveling powder is critical. Manufacturers have taken great pain in determining the proper amount of water to be utilized when mixing their products. If you want the products to perform “as advertised”, follow their instructions. Regardless of what conditions are at the surface of the slab or subfloor, it’s just as real that moisture hidden within the slab will rise to the surface and cause the cured and dried compound to react by losing adherence, flaking or breaking up. It is recommended that the concrete surface is primed with a primer before applying the leveling compound. This is meant not only to improve adhesion with the leveling compound but also to serve to seal the concrete slab beneath. In this situation, it is doubly important to know the slab’s moisture condition before proceeding. If the moisture level is high, remediation steps should be taken before application of any primer or leveling compound, or you face the risk of a flooring failure. So how can you accurately determine a slab’s internal moisture condition? 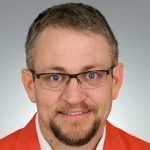 Several different options are commonly used for concrete moisture testing, but only one method actually measures the moisture condition in the slab, rather than just taking a surface assessment. RH testing has been specifically and scientifically developed to determine what the final moisture level of a concrete slab would be if the slab were sealed (with a flooring system or sealant, for example) at that point in time. With RH testing, you can also determine the moisture conditions that the leveling compound will be exposed to over time. RH testing, like with the award-winning Rapid RH®, operates by installing a sensor or probe in a test hole drilled in the concrete slab. In the case of the Rapid RH®, the sensor remains installed in the slab, and by means of a device called the Easy Reader, instant and repeatable readings can be taken as often as necessary. Other systems often require the sensor to re-equilibrate with each reading, a time-consuming reality. RH testing can be used on both new concrete slabs to determine if the concrete has reached the RH level specified by the architect, or by the flooring product manufacturer, but can also be used on older slabs to ensure that the moisture levels have not been compromised over time in any way. When your floor depends on a solid, level surface, don’t let moisture conditions in the subfloor sabotage your leveling compound application. 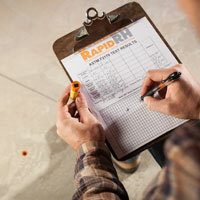 With Rapid RH® testing, you can be sure your completed floor stays completely on the level. When “Hi” shows up on the LCD screen of the Easy Reader, it means that the reading is in excess of 99.4%, whether that is RH or temperature. I hadn’t heard of that self-leveling before, but I had heard that you have to work quickly around concrete. That tip must’ve been because of the time limit based on moisture content. A good start is important but concrete moves even when settled; sometimes you’ll have to get it levelled again. I had no idea that there are tests to make sure that moisture doesn’t ruin the concrete leveling. This is a great thing to know beforehand so that the primer and other steps are not missed. My brother would love to know this as he looks into a similar service. How does the average homeowner test a new small concrete repair area (30 sq feet) for moisture content before applying leveling concrete? And, how soon after the new concrete has been poured can leveling concrete be applied? Thanks for the question. My answer to questions like this are the same whether a homeowner or contractor because there are only a few accepted methods for moisture testing. You would either need to do a relative humidity test in the concrete or a calcium chloride surface test. As far as when to apply the leveler, you need to consult the specific manufacturer’s website for their guidelines. Good luck. Super helpful information for DIY projects! I’m sure hiring an expert helps ensure the job is done right. Thanks for all the information.